When Kino was 11, and not yet calling herself Kino, a traveler came to her village during the final week of her childhood. Kino explained to him that, in order to become a proper adult, every child had an operation that removed the child and left only the grownup. When the traveler questioned this practice, the results were horrific. The end result was that Kino fled the village that was the only home she’d ever known, with only a talking motorcycle as a companion. Together with Hermes, the motorcycle, Kino travels to different countries, staying only three days in each one. Sometimes they’re nice places. More often, they’re strange, or confusing, or scary, or just plain dangerous. Kino learned how to take care of herself, but she must still use all her wits and skills to survive some places. 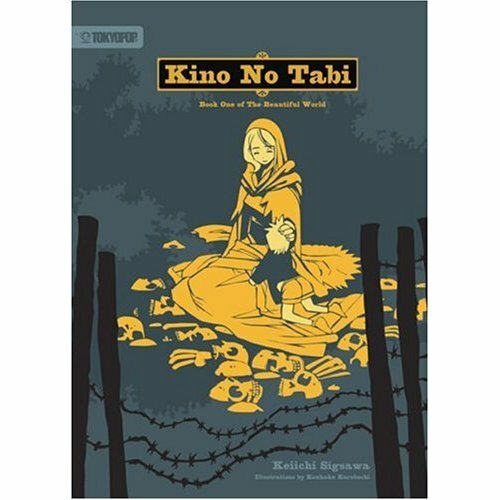 This book, taken from the popular anime series, is arranged as several short stories, detailing Kino’s travels. Each chapter is the story of her adventures in a particular country. Although Kino lives in an imagined world, there are plenty of similarities to our own. She’s independent, and can fight if she must, but she’s very relatable. Readers looking for action and adventure will find it here. Readers looking for deeper meaning will find it, too, with thoughtful reading. There are several more installments planned in this series, and I’ll be looking forward to more of Kino and Hermes.